As Bitcoin is now becoming a global phenomenon, many questions have arisen over the practicality of using the cryptocurrency. Online shoppers have become less reluctant to invest in, and indeed spend their Bitcoin as many online stores now accept Bitcoin as a form of payment. Many new startups are keen to have Bitcoin integrated onto their website, anticipating Bitcoin to be the future of e-commerce. In order to have Bitcoin however, a Bitcoin friendly hosting service must first be sought. There are numerous beneficial aspects to using Bitcoin for businesses that operate online. The existence of the internet has enabled foreign trade to be easier than ever before; however, this has created a fair share of complications - especially for transactions. Within the UK and many other developed countries, we are very conscious with regards to internet safety and security, for instance when we are making a payment online. As an increasing number of developing countries are now online too, many do not have adequate payment systems such as PayPal, and/or their bank cards are not compatible with an online store. Bitcoin essentially eliminates this issue as it is a cryptocurrency that is recognised globally, has the same value worldwide and does not discriminate any country in particular from using Bitcoin as a payment. Bitcoin can resolve online businesses losing out on exchange rate conversions. This effectively means that online business would no longer need to lose out when receiving payments from different currencies and then having to convert the currencies for a fee. This element is crucial for the success of any Bitcoin accepting business. Which hosting type to choose? Whilst there are an array of options out there such as DNS and free panels, VPS is often the method of choice for users requiring more than a simple website. Why VPS above any alternate method then? Well, VPS (for those who may be unaware of what VPS means) stands for Virtual Private Server. This essentially is a dedicated server, only it runs on virtual hardware instead. However, although a VPS will appear to the user to be a dedicated server, the VPS is actually installed onto the computer hardware and serves multiple websites too. One single computer system can run more than one VPS, each having its own unique operating system that will run hosting software for an individual user. That is common practice when one computer is not used exclusively by one person. What differentiates VPS to standard dedicated servers is the ability of a VPS user to secure the hosting and manage the hosting in general. Whilst this sounds like an unnecessary burden and/or a lot of responsibility, for some people taking matters into their own hands is preferred. Back to Bitcoin, how could you find a service online to meet your hosting requirements? Well, a prime example of a good hosting service would be GigaTux. At GigaTux, your rights to anonymity are taken into account. For that reason Bitcoin has been accepted on their hosting platform. GigaTux ticks all the boxes - it provides VPS packages, respects your right to privacy and most importantly is Bitcoin friendly too. This allows for secure Bitcoin transactions to occur, particularly useful when dealing in significant sums which you would prefer to keep out of the clutches from the likes of hackers (through fraud) or even governments for instance, which is all too common nowadays. With GigaTux, Bitcoin payments incur no additional charges and payment processing is normally registered in under a minute. If that does not convince you that the digital currency revolution is nigh - perhaps nothing will. With GigaTux's HVM offerings (mainly Windows but some BSD in there as well) we very strongly recommend users install paravirtualised network and disk drivers. In Windows, this is offered by the GPL PV installer. 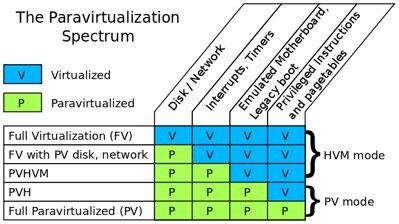 However, we didn't really know that there was more of a spectrum between PV and full virtualisation and this article by George Dunlap details how this works in a comprehensive manner. It's fascinating to hear that even what we consider standard paravirtualised Linux instances could be making use of some HVM functionality to negate the need for a PV MMU, and we look forward to this transparent speed boost in the near future! What if we could run a fully PV guest -- one that had no emulated motherboard, BIOS, or anything like that -- but used the HVM extensions to make the PV MMU unnecessary, as well as to speed up system calls in 64-bit mode? Sophos have written up a nice, comprehensive overview of IPv6 and why we need to all switch to it from a security perspective. Do take a read and always consider whether your hosting provider supports IPv6 before making any moves. GigaTux supports it natively in the US and Germany and is less than 1ms from the nearest IPv6 tunnel in the UK. IPv6, has the features and solutions the modern Internet requires that IPv4 can’t provide: greater connection integrity and security as well as the ability to support the vast number of web-capable devices we’ll need for a long time to come. But even as IPv6 brings some security enhancements, its significant changes could also introduce security holes into your environment. So why would anyone want to adopt IPv6 if it could be troublesome? KVM has, quite rightly, been getting a lot of press since its full functionality was introduced in to the mainline kernel earlier this year. However, some communities have assumed this has sounded the death knell for Xen. This article at the Xen blog offers some insights into the differences and similarities between Xen and KVM, and how they do not set out to achieve the same goals. KVM is a type-2 hypervisor built into the Linux kernel as a module and will ship with any Linux distribution moving forward as no work is required for the Linux distributions to add KVM. Having a virtualization platform built-in to the Linux kernel will be valuable to many customers looking for virtualization within a Linux based infrastructure; however these customers will lose the flexibility to run a bare-metal hypervisor, configure the hypervisor independent of the host operating system, and provide machine level security as a guest can bring down the operating system on KVM. Xen, on the other hand is a type-1 hypervisor built independent of any operating system and is a complete separate layer from the operating system and hardware and is seen by the community and customers as an Infrastructure Virtualization Platform to build their solutions upon. In fact, the Xen.org community is not in the business of building a complete solution, but rather a platform for companies and users to leverage for their virtualization and cloud solutions. In fact, the Xen hypervisor is found in many unique solutions today from standard server virtualization to cloud providers to grid computing platforms to networking devices, etc. We're actively trialling Xen 4.0 and continue to be very impressed with this, especially liking blkback2. We're also looking forward to shared memory pages. A very interesting article from The Register has been published which contains information on how many different virtualisation technologies companies use at the time. This clearly shows that there is no single winner when it comes to commercial use of technologies such as Xen, KVM or VMWare's solutions. GigaTux will keep on using Xen for now, but are keeping an eye on KVM particularly. We are intending on only considering open source virtualisation solutions, so VMWare is out of the picture for us, but the article above certainly shows that competition is present, and competition is generally a good thing! What we found is that the large majority of customers (71 per cent) haven’t settled on a single x86 virtualization solution. Although 82 per cent of our survey respondents said that they are using VMware on at least some of their systems, we found that Xen variants from Citrix, Sun/Oracle, and Xen.org were being used by more than half of the customers we surveyed. Another 31 per cent of customers said that they use KVM.